Flash floods may bring reassessment of fossil fuels' true costs. 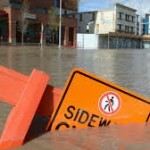 Last Thursday, rising flood water overwhelmed Calgary as suddenly as an earthquake. Wednesday’s torrential rainfall seemed to be just another instance of Calgary’s skies dumping a month’s worth of precipitation in one day. But then the rain continued on Thursday too — and, says a CBC report, the combination of still frozen ground in the mountains, saturated soil, and water’s tendency to run downhill led to a flood that paralyzed Canada’s fifth largest city. By 8 am Friday morning, Calgary Mayor Naheed Nenshi had declared a state of emergency, stopped the commuter trains, and sealed off downtown. Smooth, swift neighbourhood evacuations began early in the afternoon. More than 75,000 people from twenty riverside neighbourhoods were relocated by the end of the day, mostly welcomed by family and friends. 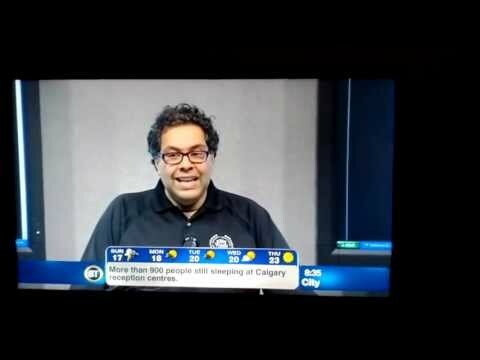 Calgary Mayor Naheed Nenshi became a Youtube sensation. Calgarians not directly affected by the flood promptly leaped into action, swamping city shelters with offers of food, clothes, money and volunteer hours. By Sunday, Albertans had donated $2.1 million to the Red Cross for flood relief — including emergencies in High River, Canmore, Banff, Lethbridge, and Turner Valley. Apart from a few areas of frantic activity, most of the city looked like a ghost town, even the areas that weren’t evacuated. “The single most important thing you can do to help is to stay home,” Mayor Nenshi urged the public. “Make Friday a family day.” He discouraged disaster tourism and asked Calgarians to leave the streets clear for emergency workers. With most schools and workplaces closed — and 600 soldiers arriving to patrol evacuated areas and deal with hazardous materials — the city wasn’t locked down, but it sure was shut down. Until this event, the 2005 flood was the worst to hit Calgary in a century. In that event, dubbed a “hundred year flood,” 40,000 homes were damaged, and 1500 people evacuated during the emergency. Once every hundred years? Some people might think that’s a tolerable risk for desirable property next to the sparkling Bow and Elbow rivers that run through the city, so clean that residents and tourists alike can (and do) hook rainbow trout, right in the heart of downtown. Fed mainly by mountain snow and glacier melt, Calgary’s chilly rivers usually run fast but shallow along a mixed shoreside demographic stretching from modest homes along the west to expensive inner city neighbourhoods that back on to the usually tame, placid Elbow river. In some places, the rivers have carved ravines so deep they might not be visible from the road. So Calgarians were astonished to see a photo showing water rising over the tops of those ravines, lapping over the top of a foot bridge above the usually meandering Elbow — a bridge normally at least 20 feet above water level. Similarly, the Bow flooded up to the bottom of the bridge to Edworthy Park, usually at least 25 feet above the water level at the bottom of the ravine. In the video below, the current smashes an uprooted tree into toothpicks by battering it against the Lower Deck of the Centre Street bridge. 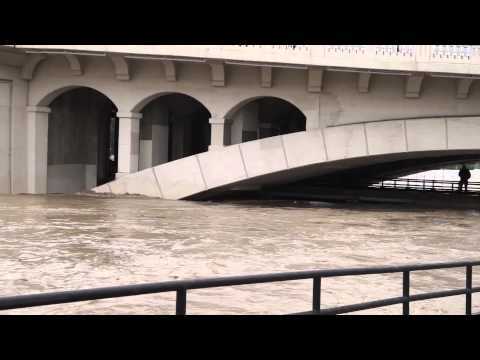 Calgary bridges barely rise above raging flood waters. Downtown Calgary, now awash with dirty water, flotsam and jetsam, sits between the Bow and the Elbow rivers. For the big city Calgary has become — 1.2 million people and 280 square miles — downtown is still fairly small, nestling into the arch formed by the Bow River, with the Elbow River winding its way along a third side. With no room to sprawl, growth has been skyward, especially with the new 58-storey Bow Tower looming over virtually every view of downtown. As it turns out, the parking garage and the first sixteen feet of a building are the most important areas when the water rises. Vehicles and electronics tend to malfunction when exposed to water, yet they are often stored on the lowest levels. But as it turns out, the parking garage and the first sixteen feet of a building are the most important areas when the water rises. Vehicles and electronics tend to malfunction when exposed to water, yet they are often stored on the lowest levels. Since Calgary holdsw88ประเทศไทย Canada's second-largest concentration of head offices, after Toronto, the flood submerged a lot of valuable computer data, which will have to be salvaged or replicated. Some areas of downtown probably will not have power again for weeks, or possibly months. Among the companies affected are the major oil corporations and pipeline companies, such as Enbridge and Suncor. Not only are their head offices without power, but — following a 750 barrel spill of synthetic oil from a pipeline approximately 70 kilometres (43 miles) south of Fort McMurray — Enbridge shut down that pipeline and two others in Alberta. As Stephen Leahy points out, flooding in the Fort McMurray area portends catastrophic consequences should the northern rivers overflow tar sands tailings ponds. Speaking of oil companies…some observers have pointed to climate change as a factor in the extreme flash flood. Calgary’s climate is usually semi-arid, its proximity to the snow-covered Rocky Mountains balanced by its proximity the other direction to the badlands, or northwest desert. Provincial issues tend to revolve around irrigation and water rights, not flood control. “The reality is that fresh water is more valuable than crude oil,” Former Premier Peter Lougheed famously said in 2005. Yet, as David Suzuki noted recently, the World Meteorological Organisation's Statement on the Status of the Global Climate in 2012, predicted climate change would cause extreme weather events, including "major heatwaves and extreme high temperatures, drought and wildfires, extreme precipitation and floods, snow and extreme cold, and tropical cyclones." Germany and the Czech Republic had massive floods in May and June, not to mention India, where 1000 people died. No one disputes that the city of Calgary ran an efficient emergency program, with frequent public communications — or that Calgarians rose to the challenge with an outpouring of volunteerism and generosity. Yet some wonder whether the province should have implemented recommendations from the 2006 Provincial Flood Mitigation Report, long before now. And while most welcomed Premier Redford’s announcement of provincial funds for homeowners to help repair and rebuild flooded homes, some question why Canadians can’t buy flood insurance on their own. Floods seem to be rolling across the country. The storm bulge surged down the two rivers to the South Saskatchewan River, which flooded Medicine Hat. Downstream, the province of Saskatchewan sprang to alert and evacuated both the town of Cumberland House and also Cumberland House First Nation. Unfortunately, First Nations in Alberta seem to have been left very much on their own, even though they were flooded too, lost in the federal-provincial shuffle over who is responsible for their welfare. One thousand people had to be evacuated from the Siksika nation in southeast Alberta, and were pretty much left to shift for themselves at the reserve Sportsplex. However, their Facebook page now indicates that people have responded with supplies and donations. One firefighter told a CBC Radio One host that this is the fourth hundred-year flood he’s seen during 20 years on the job in Calgary. Each flood brings important lessons — about not storing electronics in the basement, for example. Premier Alison Redford has already suggested that rebuilding Southern Alberta might take ten years and pledged $1 billion in provincial funds. Watch what happens when the estimates come in for repairing the C-Train and some of the larger downtown buildings. This flood, in particular, could be a wake-up call about the true costs of fossil fuels. Penney Kome is an award-winning author and journalist who has published six books with major publishers. She is also the Editor of Straight Goods. She is co-editor with Patrick Crean of Peace: A Dream Unfolding (1986, Sierra Club Books). She started marching against the atomic bomb when the placards were taller than she was, and she emigrated from the US to Canada in protest against the war in Vietnam.